from 40 pcs. 0,41 EUR ea. from 80 pcs. 0,38 EUR ea. from 160 pcs. 0,35 EUR ea. 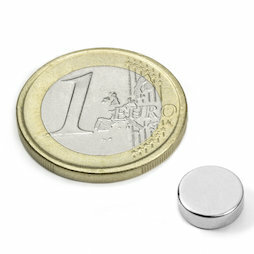 The small flat disc magnet with the extremely strong N52 magnetisation. Despite its small dimensions it features an adhesive force of almost 2 kg. 20 pcs. 0,37 EUR ea.